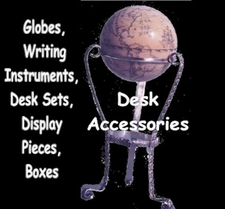 Since 1968, personalized scrimshaw jewelry, knives, and display pieces - using only fossil Ivories. WE USE NO ELEPHANT IVORY! Our REGISTERED WHALE IVORY is available only in INTRASTATE commerce, within the state of Maryland - sent only to clients with Maryland addresses. 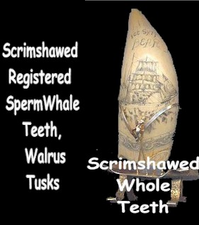 We are the Web's only source for registered, legal scrimshawed Sperm Whale teeth! It takes a lot of work to stay 200 years behind the times! Each piece is exquisitely etched by hand (no machine etching) and personalized for you in our studio by our only scrimshander M. M. Cohen, who has been producing museum-quality scrimshaw since 1968. 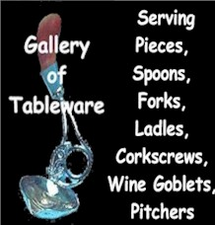 (and check out our low prices!) Each piece is handmade in our studio and signed. Marvin is widely recognized as one of America's leading scrimshanders, as well as a creative designer specializing in custom and semi-custom knifemaking, jewelry wearables and objects that illustrate traditional Arctic region Native American tales and myths, reinterpret ancient shamanistic images, and translate the spiritual aspects of earth, water and sky into meaningful and personal contemporary wearables. His wearable pieces combine strong images with powerful mythology; his etchings reflect authentic traditional nautica and eloquent portraiture. HIGHEST QUALITY - you'll be proud to own or give a gift made by Ancient Ivories Studios! ALL AT A VERY AFFORDABLE PRICE! Personalize with a Name, Initials or Date. Your personalized piece will be delivered to your door! It's that easy! We make ordering gifts a snap! No easier way to do all your shopping - and no piece will be more treasured! Ask us about our convenient Lay-Away plan! Need a very special anniversary or birthday gift? (The traditional fourteenth wedding anniverary gift is Ivory!) We will happily substitute the traditional semi-precious gemstone for your particular anniversary or birthstone on any of our pieces! From Ivory-headed canes to personalized poker chips: From carved ivory dolls to crochet hooks, Ancient Ivories Studios has been designing and handcrafting custom heirloom quality items of every type in our studios since 1968! Just call us or email with your special request! You'll be happy you did! WE OFFER THE LARGEST SELECTION OF FOSSIL IVORIES ANYWHERE! INCLUDING FOSSIL WALRUS (including rare blue walrus), FOSSIL OOSIK, LEGAL REGISTERED SPERM WHALE (Sperm Whale ivory can be sold and shipped only within the state of Maryland), MAMMOTH (INCLUDING RARE BLUE MAMMOTH), THE WIDEST SELECTION OF NATURAL FOSSIL IVORY COLORS, AND MOST EXTENSIVE SELECTION OF SCRIMSHAW ITEMS ON THE WEB! NONE OF OUR IVORY IS CONTEMPORARY, AND NOT A SINGLE ANIMAL HAS BEEN KILLED, CULLED, OR OTHERWISE HARMED TO PRODUCE OUR FOSSIL IVORIES. ANCIENT IVORIES STUDIOS OFFERS THE ONLY PERFECT, ECOLOGICALLY-SOUND, HUMANE WAY TO OWN AND WEAR WARM, WONDERFUL AND ENDURING IVORY. TO READ WHAT OUR CUSTOMERS SAY ABOUT US, PLEASE CLICK ON THE LINK AT RIGHT. Let us produce an original and compelling scrimshaw etching of your favorite scene on any of our pieces - animals, portraits, scrimshaw ship's portraits (including your own boat! ), landscapes, flowers, etc. From scrimshaw jewelry to scrimshaw whole Sperm Whale Teeth - We handcraft and even personalize any piece with a scrimshaw name or initials along with the design of your choice. Just email us at aistudios@comcast.net and let us know your special needs! This is a secure site: We accept Visa, Mastercard and Discover!. Every piece complies with the regulations associated with the Endangered Species Act, the Marine Mammal Protection Act, and Maryland state environmental and ecological laws.All of our designs are original and copyrighted. As has been our policy since 1968, your complete satisfaction is unconditionally guaranteed, or your money will be cheerfully refunded. Want to be on our email list to hear about our special offers? Just email us at studio@ancientivories.com with "email list" in the subject line. FOR A MAP OF OUR SITE, PLEASE CLICK ON THE LINK AT RIGHT. Have a question? Just call us at 240-997-0264. Want to help us design your scrimshaw piece? 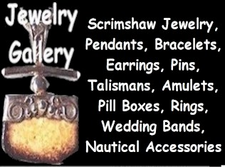 Whether it's a fossil ivory Amulet or Talisman, Scrimshaw jewelry, personalized scrimshaw knives, Fossil Ivory Wedding or Commitment Band, scrimshaw sailor's Knife, Sterling Silver and scrimshaw Box, Scrimshaw Sperm Whale's Tooth, or Sterling Silver and Ivory scrimshaw Spoons and Tableware, just email us and we will work with you for a very personal scrimshaw piece you'll love to use or wear!Please note: We reserve the right to limit quantities. Please note: International customers are responsible for all taxes, duties and fees required by their customs services, which are levied once the package reaches your country. Additional charges for customs clearance must be borne by you; Ancient Ivories Studios has no control over these charges and cannot predict what they may be. Customs policies vary widely from country to country; the Buyer should contact his/her local customs office for further information.